Lou Adler is an HR professional and author who writes on topics related to hiring. Two of his articles are Let’s Fix It: End The Talent Shortage by Hiring for Results, Not Skills and To Hire Better People Define The Job Before You Define The Person. Lou writes that it’s what you DO with what you have that makes you successful, not what you have. And points out that most job descriptions are what he calls “skills-infested”. They are lists of specific skills, tools, and experience. “X years experience in industry Y”, “Z years using CAD package A or CAE package B”, and “C years experience designing parts with manufacturing method D” are the types of things we see in engineering job descriptions all the time. Instead, Lou says we should be asking, what do the best people do differently than the average person? So, what do the best mechanical engineers and designers do differently? They know the right questions to ask to get things manufactured. They are fluent at thinking in three dimensions. They are able to break down complex problems into smaller more manageable problems to solve. They empathize with the customer in order to solve the problems of people different from themselves. They are concerned for both the big picture and the small but important details. They keep an open mind, learn all there is to know about a problem, and then use their expertise to identify and implement a good solution. They are good at turning abstractions into working ideas. They have remarkable grit and an ability to use math, intuition, analogical thinking, and strong spatial reasoning to solve problems. They build stuff — working prototypes, computer models, building on the ideas of others, or even just folding a piece of paper. Most importantly, they have a curiosity and a passion for how things work, and they live, eat, and breathe figuring out better and simpler ways of doing things, including things in their day-to-day life. When I was doing some consulting work earlier this year, I was working on an assembly of vacuum formed parts. Since I had never worked on vacuum formed parts before, I did the usual research to find out parameters that I needed. Then I developed the parts with that information. Later, when my client and I were on the phone with a vacuum forming manufacturing company, the engineer on the other end of the phone surprised me by exclaiming, “You really know how to get things manufactured!” I thought this odd, saying that I did after all have an advanced engineering degree. She responded that she had worked with many people with advanced degrees who couldn’t do what I was doing. What I had been doing was asking the right questions — was the draft angle I used ok, what thickness did the material come in, what blank size did it come in, how much thinning could I expect with the geometry I had designed, and so on. It wasn’t about knowing all about vacuum forming, but about how do you approach a manufacturing process that is new to you. When I was at Magna, we had a small group of engineers all sending jobs to the same server, and a queue management system was not in the budget. I proposed and put into practice a “poor man’s queue management system”, in which we met once a week to establish project priorities, then documented them on a whiteboard which everyone could see, and used the unix “nice” command to set and change priorities as needed throughout the week. When I was on the GM EV1, one very contentious issue was whether to encapsulate the windshield and rear window. Encapsulation involves an additional manufacturing step — after the glass is complete, it is put into another tool, an injection molding tool, and the moldings are created by injection molding them directly onto the glass. This simplifies the installation of the glass, as there are fewer parts, but it also changes the way tolerances stack up. Since the encapsulation goes where the glass goes, there is no opportunity to use the moldings to help compensate for smaller or larger gaps due to tolerances. On this vehicle, direction from Design Staff was that the oval line of the roof was very important, and this line was the boundary of both the windshield and rear window. So someone laughingly made the comment that it would be better for us to encapsulate the roof, to help make that a consistent line. The engineer who said that was joking, because no one had ever heard of encapsulating a body panel, and assumed it could not be done. But even though the roof was not my part, I decided to research it as a serious option. I found that it was completely possible, and it would work well to accentuate the line of the roof, although we decided in the end not to do it due to cost. When I was at GM, I invented a new structural part to stiffen a joint in the Chevy Malibu and improve side impact performance. This was especially challenging because it was in the middle of a complex joint with many parts coming together and each having their own constraints. When I was at SC Solutions, the group was using antiquated methods for building models, while at the same time, model geometric complexity was growing. I was asked to research options to improve our ability to build complex meshes in a more user friendly way, and yet to continue to use the same underlying number cruncher software that we were using, Adina. I first confirmed that there were no pre-processors on the market that were designed to work with Adina. However, I realized that I could create a work-around, by using a pre-processor to write out a Nastran deck, then reading the Nastran deck into Adina. So I considered any pre-processor that could write out Nastran. I recommended we bring in two pre-processors. One of them was retained after the first year. I also developed a set of workarounds and wrote scripts that allowed the pre-processor and Adina to work together more smoothly. I taught and tutored others in the division on how to take best advantage of said workarounds and scripts. Several big projects were done using HyperMesh, one of the new to us pre-processors, and my boss, the head of the division, said it would have been impossible to accomplish those projects without my work. When I was at Altair, we found that the Software QA group was not always finding the same types of bugs that users were finding. Users of the software tended to be working with more complex models, where multiple aspects of the software interacted in more unpredictable ways. I came up with the idea of creating a set of “user-based” tests to more closely simulate how a typical user uses the software. Combined with the automated testing we were already doing, this resulted in much improved coverage and a higher liklihood of finding bugs before users did. Even when I am not at work I often find myself figuring out better and simpler ways of doing things. A couple of years ago I was in a coffee house that was my usual hangout, and chatting with one of the employees there. He was complaining about the task he was working on, which was writing the names of pastries on paper bags. This coffee house had the practice of selling pastries at a two for one price after a certain time in the afternoon. So coffee house employees would 1) decide which two pastries to group together, 2) put them in one bag, and 3) write on the bag the names of those two pastries, as well as a title like, “Better the next day! Two for the price of one!” (paraphrased). Said employee was complaining because this was his most hated and tedious task. I suggested that since they know the names of all their pastries up front, they could make labels for each pastry name, an additional label for the bag title, and substantially shorten this task. The employee liked the idea, but felt that management would not want to consider any variation in current practice. What about you? Do you have examples of some of these qualities from your own career? Do you have other items that I did not list? Let me know in the comments. 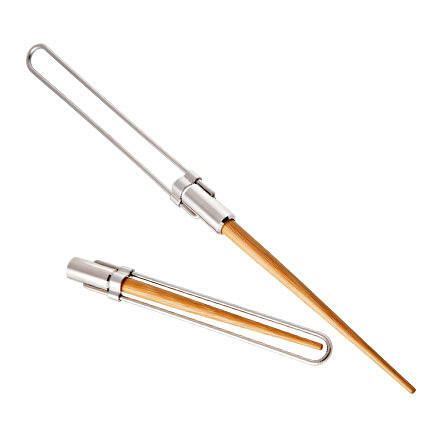 Someone on LinkedIn just pointed to these chopsticks made by Brunton and I think they’re mighty cool. They look stunning, and while I haven’t tried them yet, I am told by a user that they work well also. I love the honesty of the materials — both the bamboo and stainless steel look like what they are and are not hiding behind veneers or the like. And each of the materials are well suited to the product. These foldable helmets from Japan are not only cool, but they’re a practical way to enhance safety. Somebody put some thought into these! A year or so ago I had someone ask me in an interview what designed things I thought were cool. In the heat of the moment I had trouble coming up with things to talk about, but of course on the drive home there were several that came to mind. First of all, I adore bridges. Unlike many other built objects in our environment, you can usually actually see the structural elements, without them being covered up in cladding or facade or a case. 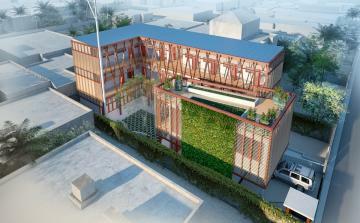 Thus they allow us to fully appreciate the interaction of aesthetics, forces and materials. 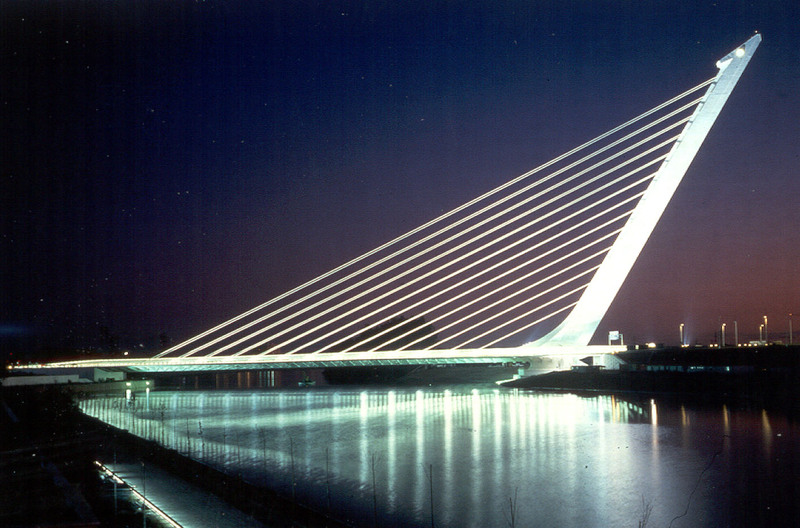 One of my favorites is the Alamillo Bridge by Santiago Calatrava. One can almost feel the reaching out of the main tower and the tension in the cables. 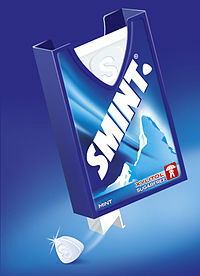 Smints container. The white inner piece is a single injection molded piece that includes a molded in leaf spring, a stop, and a small cavity large enough for one mint. When you push on the top with your finger, the leaf spring compresses, and the small section comes out the bottom, perfectly dispensing only one mint. 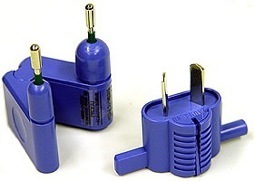 The Sascom international power plug adaptor. This small device can convert between any of 7 different types of power plugs throughout the world! The Xtracycle FreeRadical This allows your bike to become an actual practical item of transportation, allowing you to take your kids to day care, pick up groceries, or even pick up the other bicycle of the household from the bike repair place. 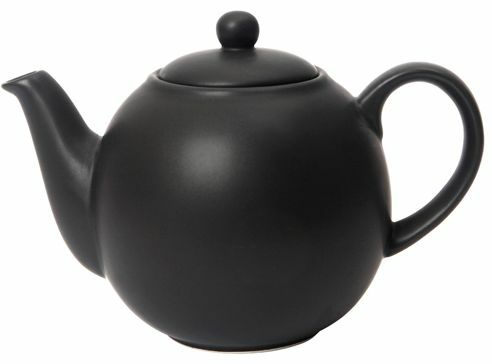 My teapot. Very similar to this one. The shape is pleasing without trying too hard or being cutesy, the ceramic holds heat in well so that your 2nd cup is as hot as your 1st cup, and the spout doesn’t drip (this is harder to do than it sounds). 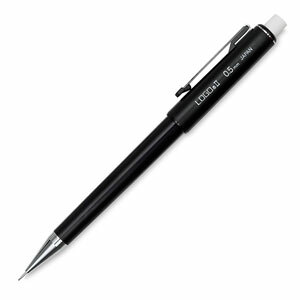 Papermate mechanical pencil. This particular pencil has everything needed to work flawlessly, but nothing added only to add fanciness or cost. 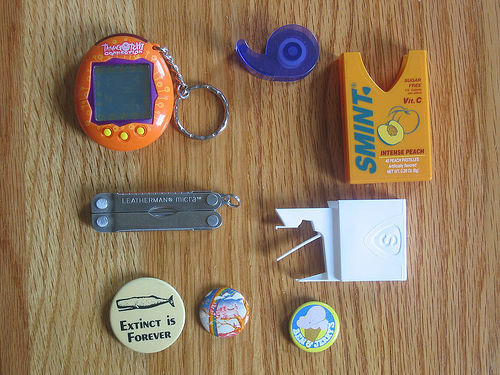 The clip is metal so it doesn’t break, it’s designed with an eraser that is actually large enough to be useful, etc. I actually own more than one of these. A very interesting article entitled “It’s not ‘Mess.’ It’s Creativity.” recently appeared in the New York Times Sunday Review. It quotes from studies showing that people put in a messy room tend to choose options labeled ‘new’ over options labeled ‘classic’. They also, while not necessarily having more ideas, were found to have better ideas (that is, more ideas scored by the judges as “highly creative”). This isn’t necessarily a new idea, though these particular studies may be new. What it makes me think of is that every time I have moved into a new cubicle or office for work, I have been covering the walls with a selection of pictures, quotes, drawings and other things that I found inspiring or beautiful or interesting to look at. This results in a sort of mosaic effect, so that everywhere you rest your eyes, there is something different to look at. Based on this research, I now wonder if all these years I have been self seeding my creative process by doing this. What do you do that engenders messiness and creativity in your work life? As it turns out, a low to medium level of background noise can actually improve your creative thinking! This article from The Atlantic explains. When do you need a creative idea? I saw an interesting article on Forbes today, entitled Entrepreneurs Need Creative Thinking After the Idea. The author makes the extremely valid point that we don’t just need to use our creative muscles at the beginning of the process. Instead, the most successful of us go back and forth continually between the more creative, wild and crazy way of thinking, and the judging and sorting way of thinking. We need both of these at every stage of the process, whether we are designing and building a part or a company. Need some gasoline? Make it out of plastic! I just saw this article in the paper about a project to clean up the big patch of floating plastic in the Pacific, and at the same time create fuel for the boat doing the clean-up. Quite a win-win situation, when you think about it! A recent article explains the change to California law, which now requires kids to be in a booster seat until they are 8 years old or 4’9″ tall, whichever comes first. Previously, the cutoff was 6 years old or 60 lbs, whichever came first. Making the criterion be height rather than weight makes a lot of sense, because how the seat belt hits a child depends more on height than on weight. For a seat belt to work properly, restrain the passenger, and prevent injuries, the shoulder belt should go across the chest, and the lap belt go across the pelvic bones. If the shoulder belt goes across the neck, or if the lap belt hits the soft tissue of the abdomen, the belt itself can cause injuries. And while safety and crash engineers have put a lot of thought and work into making all the safety features in a vehicle work for many sizes of people, it’s a tough challenge to make something work for children as well as, for example, a beefy football player. I expect this to be another in the series of changes that have been reducing death and injury in automobiles.